Watching Lourdes work amazes me. It is a big operation with Masses going on all over the place all the time. Hundreds of wheelchairs processing through the streets with thousands of volunteer nurses and assistants and it all goes like clockwork. There is a sense of prayer and the reality of God here and it is wonderful to immerse ourselves in the life and prayer of Lourdes. 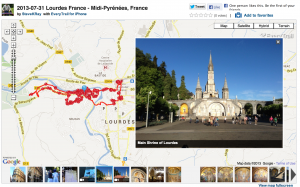 Today it is supposed to be 92° in Lourdes and tomorrow 100° so I decided to start early with my walking tour covering all of Lourdes. This is an incredible Catholic shrine and my wife Janet neither have enjoyed being here. 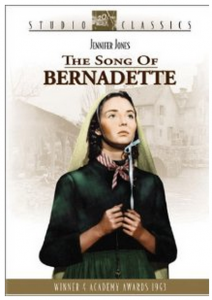 If you haven't watched the Academy Award winning Song of Bernadette lately, it is worth a watch. But today I wanted to take a walk through everything to become very familiar and to share it with everybody else. I started at the main Basilica’s going to the grotto, then all around along the Pau River into the country and up in the mountain for the stations of the cross before coming back down to the shrine area and then into the village to see all the places related to St. Bernadette’s childhood. My tour has an interactive map, commentary, 16 videos and 160 pictures. I hope you enjoy it!